EML Laser modules in C-band (1530 - 1565nm), with built-in electro-absorption modulator. 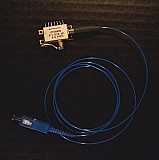 With single-mode fiber (SMF). E2550S23, 1558.98nm; E2550S29, 1554.13nm; E2550S33, 1550.92nm; E2550S39, 1546.12nm; ~1.55um laser module with 10Gb/s EML(EA-mod). Triquint P/N: E2550. with integral driver IC. 1.55um EML laser module with built-in 40Gb/s EA-modulator. With GPPO-male RF connector. OKI P/N: OL5158M-LC.